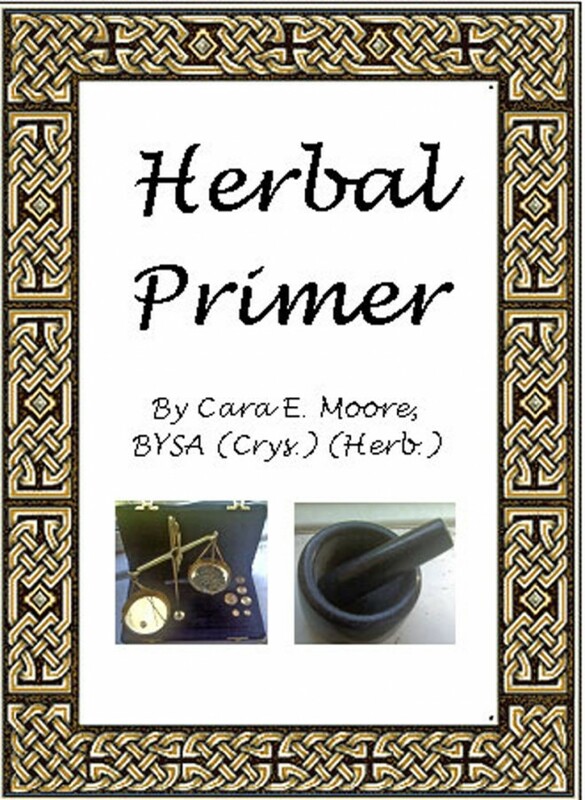 Herbal Primer is a practical Herbal Primer for Herbalism Practitioners which includes sections on Aromatherapy Uses, Herbal Action Classifications and Herbs for Body Systems and Herbal Preparation for creams, compresses, decoctions, infusions, poultices and tinctures. Sections on Herbal Identification of Dried Herbs and Recipes for Herbal Products, Herbal Dyes, Incense, Pot-pourri and Teas. Ancient Egyptians used hundreds of herbs for healing and rituals. The Ebers Papyrus dates from around 3550 BC. Ancient writing of Hippocrates (lived 460 to 370 BC) and Materia Medica (Science of Healing Drugs) of Pelanius Dioscurides (AD 40 to 90) wrote a compendium of more than 500 plants that remained an authoritative reference into the 17th century. Ayurvedic (Indian) herbal medicine has the Sushruta Samhita (Sushruta in the 6th century BC) describes 700 medicinal plants, 64 preparations from mineral sources, and 57 preparations based on animal sources. TCM, Traditional Chinese Medicine also has a long history of herblore and practical applications. The Shennong Bencoa Jing, compiled during the Han Dynasty but dating back to a much earlier date, possibly 2700 B.C., lists 365 medicinal plants and their uses. Medical schools known as Bimaristan began to appear from the 9th century in the medieval Islamic world, and Ibn al-Baitar described more than 1,400 different plants, foods and drugs, with over 300 of which were his own original discoveries, in the 13th century. The nun Hildegard of Bingen (1098 – 1179) was an authority on medieval herbal medicine and wrote Physica of Plants. The experimental scientific method was introduced into the field of Materia Medica in the 13th century by the Andalusian, an Arab botanist Abu Al-Abbas al-Nabati, the teacher of Ibn al-Baitar. Al-Nabati introduced empirical techniques in the testing, description and indentification of numerous Materia Medica, and he separated unverified reports from those supported by actual tests and observations. Both Henry the Eighth and Elizabeth the First were avid herbalist, Henry the Eights passed laws (1543) allowing people to continue to practice herbal medicine so the ordinary person would have access to medical care. The English Physician Enlarged (1653) by Nicholas Culpeper included traditional medicine with astrology, magic and folklore was ridiculed by physicians of his day yet was very popular. The Age of Exploration and the Columbian Exchange introduced new medicinal plants to Europe. The Badianus Manuscript was an illustrated Aztec herbal translated into Latin in the 16th century. The WHO recognizes that for most of the world, herbal treatments are used as a necessity and Herblore is a vital tradition. Herbalism is a healing art that sees the person in a holistic manner, the mind, the body, the spirit, as one. Lifting one’s frame of mind with Aromatherapy or an herbal tea is as important as making a poultice for a boil or rash. It is about bringing balance back in a gentle, nurturing way that limits side-effects. When visiting an Herbalist a history of the patient is taken. The goals of the treatment are discussed, be it Stress, troubling sleeping, general run-down feeling or something more specific such as a rash or Anxiety. It is important to complete this history, to ensure no detrimental interaction occurs between prescription drugs and conditions and herbal treatments. There are fewer side effects with Herbal treatments because the concentration of dosage is lower, but all herbs have to be used with a healthy respect. Teas and herbal baths are the most gentle introduction and if they prove effective, capsules can be made for more ease of convenience. (such as ground Feverfew for a migraine). Aromatherapy is an important part of Herbalism. Essential oils are extremely concentrated and must be mixed with carrier oils and reduced to ¼ of the dose for infants over 1 month old, such as chamomile or lavender. It is not recommended to use more stimulating essential oils as it puts a strain on a young child’s metabolism. Most herbal teas and treatments used should show a result within 3 days and should be discontinued immediately if any adverse reaction occurs. Herbalism is seen as a complementary medicine and an Herbalist will refer a client to a doctor for clarification of symptoms. One of the major benefits of Herbal treatment is its individual nature. Different combination of herbs are used to facilitate this nature of approach. Sometimes when a person is very unwell; a combination of conditions are present, herbs are used to bring the body back into balance, boosting the body’s own healing process. Diet and Exercise are also an important aspect of Herbal treatment. Meditation can also be used to calm the mind and body. After the initial session, future sessions are used for feedback on the effects of treatment and any modifications needed are discussed and implemented. and women with arthritic hips, knees or hands who took part in the study on rosehips reported a significant reduction in pain after taking the supplement for three weeks. They also cut their consumption of standard painkillers by 50%. The findings, published in the Scandinavian Journal of Rheumatology last year, followed a Norwegian study which found that restricted movement caused by osteoarthritis was reduced by 40% in patients taking rosehips." Herbal preparation, with the exception of essential oils, which is a complicated process, is within reach of most people, tinctures, poultices, infused oils, herbal teas and powders into capsules can all be done by hand.